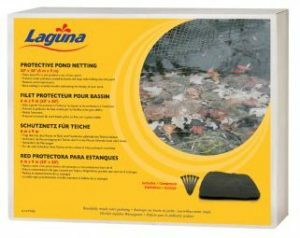 Laguna Protective Pond Netting provides several key benefits designed to make water gardening more enjoyable. It protects valuable pond fish from predators looking for a free meal, plus it keeps leaves and debris out of the pond, reducing the possibility of submerged circulating pumps becoming clogged. The black netting material blends in naturally in the water garden. The pond netting comes complete with stakes to secure it in place.